Pirin is the most worthwhile mountain to go trekking to, and I can show you why, by offering full private services, guiding you to its notable spots where you will discover its peaks, valleys, lakes, streams, mountain chalets with welcoming facilities, the scrumptiousness of mountain made yoghurt and of mountain berries, to name but a few. Why you should let me create your hiking itineraries? My full guiding services come with the all round organizing of your transportation, so that from the moment you arrive in Bulgaria you will reach Pirin in comfort and convenience and can immerse in its majestic beauty. Start planning your trekking adventure in Pirin mountain, Bulgaria. Just let me know more about what you want to see and I will show it to you. Bulgarian mountains, especially Pirin, which is a national nature park and a UNESCO nature site, contribute to the history and significance of the country in unique ways. You can discover them with my help, and I can also offer you self guided hiking tours. I can help you explore Pirin with delight, and scale its highest peak Vihren. We can start trekking from Bansko, go up to the Bunderitsa chalet, where the oldest tree in Bulgaria can be seen. Then, further in the mountain, we arrive at the Vihren chalet, from where we can head to the peak which rises at 2,914 meters. Climbing to the peak will take about two hours, and the delight of seeing the panorama from the top will be rewarding. If we go to Melnik, the smallest town in Bulgaria boasting unique sandstone pyramids, we can then head to Sandanski, another popular starting point for trekking into Pirin. The chalets that we will reach from there are in picturesque locations, and we should also trek to the Tevno lake, high up in Pirin. Trekking in north Pirin is rewarding, as it is the largest part; it starts from Predela. The landscapes there are of Alpine nature, with lakes, shelters, and well marked trails. North Pirin features Vihren, its highest peak. In the central Pirin, which is the smallest part, the highest peak is Orelyak. In the south part, the forests are abundant, but there are no chalets. Each part has its beauty it reveals to trekkers. 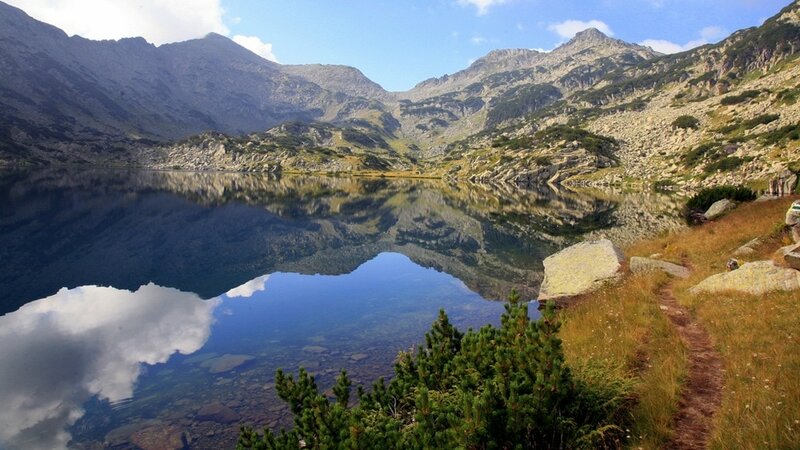 I can recommend also visiting the Popovo lake, and we can look for the rare edelweiss plant. An alternative starting point for the trek to Vihren is from Razlog, another town in the mountain folds. Razlog is also famed for its location between Pirin and Rila, Bulgaria’s notable mountains, so we can take advantage and consider plenty of treks to pursue. The locality between the two mountains is called Predela, it features resthouses, and if we go in the winter, the 1,300 meters long ski slope is another benefit. In August the locality is replete with visitors to the annual Pirin Sings festival dedicated to folklore. So, talk to me now and let me design your dream hiking tour in Pirin mountain, Bulgaria!